Having some time off from work allowed me to finally take some donations to one of my favorite local thrift shops. Now I can begin to fill those empty donation boxes again. I was going to try to be good, like Diann from The Thrifty Groove, who can donate at the thrift and successfully fend off the desire to subsequently shop at the thrift. Of course, I told myself that I had to go inside, if for no other reason than to look for the elusive airplane for Paulette’s (Cheerful Thrifty Door) grandson. So, inside to shop I went. My, how the prices have increased! It wasn’t hard to pass up many items as they were well over my budget. I did find a few things (you had doubts?) but not the little red airplane. 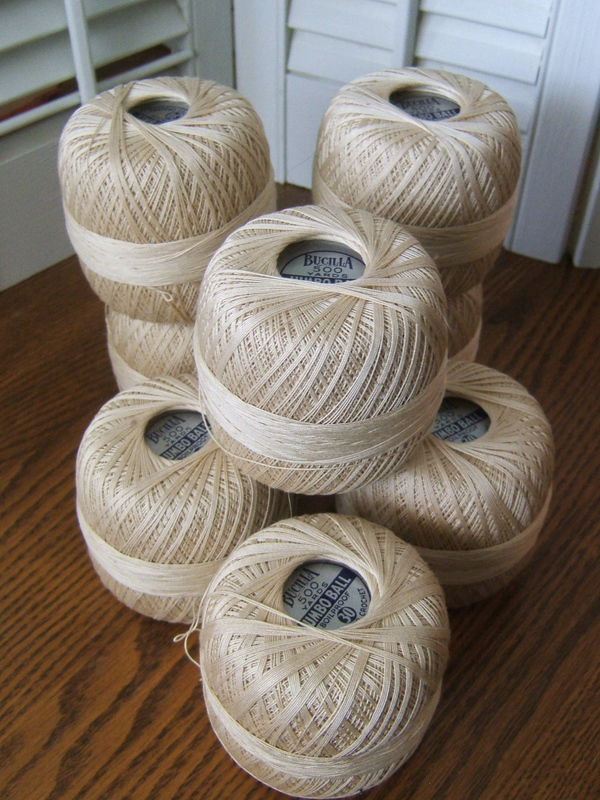 There is something aesthetically pleasing about these Bucilla balls of crochet cotton. I liked their color and thought they had some interesting decor possibilities. Stacked on top of my recent Sears Roebuck & Co. scale purchase, piled into a large glass container, or filling a basket are some ideas that ran through my head when I saw them. Red and white is just right! Of course you know I couldn’t pass up this next item. Do you see the key? Can you find the fish? 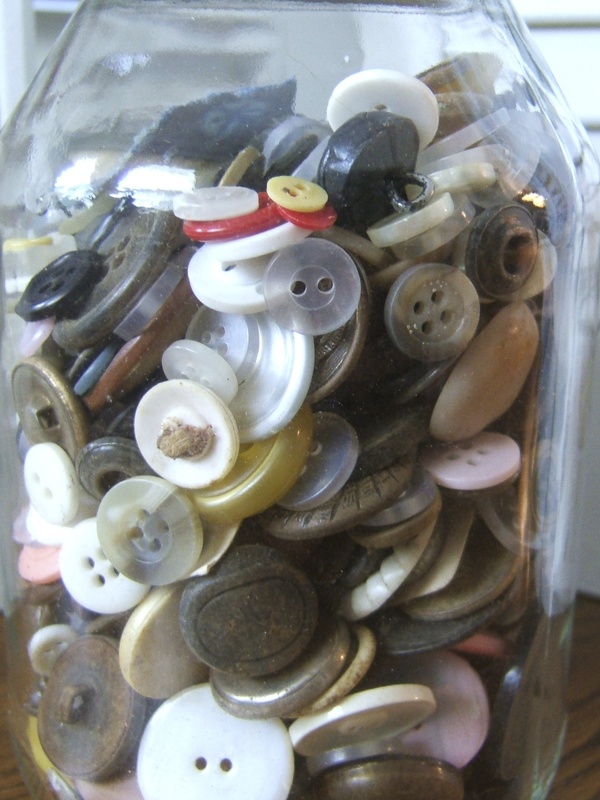 Part of the fun of a big jar, bag or tin of buttons is spilling them out to see what treasures await. The key was a surprise. So were the number of metal buttons. This $3 jar will provide me with many hours of joy. I’m looking forward to sorting through these beauties. If I tell myself that I can’t go to this thrift shop again until I have another box (or boxes) to donate, then that should be enough incentive to gather some items and fill that box up soon! The best part is that if I give a little and buy a little it all goes toward a very good cause. I hope to visit the following bloggers and parties this week and I hope you get a chance to as well. Knick of Time’s Knick of Time Tuesday, Nifty Thrifty Tuesdays at Coastal Charm, Thrifty Things Friday at The Thrifty Groove, The Penny Worthy Project at Hey, What’s for Dinner Mom?, Helen and Her Daughters, and Cheerful Thrifty Door and Her Library Adventures. 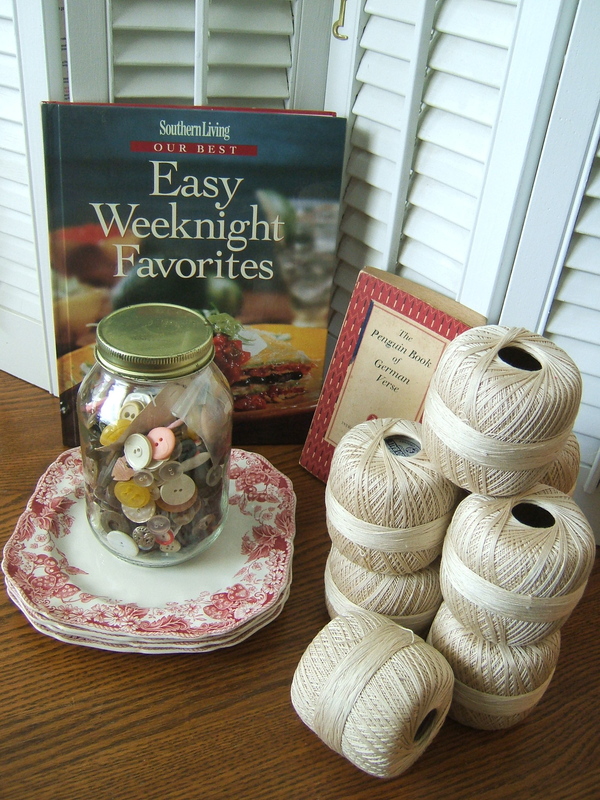 This entry was posted in Buttons, Dishes, Recipes, Tablescaping, Thrifting, Uncategorized, Vintage and tagged Bucilla, Buttons, Cookbook, Crochet, German Verse, Johnson Brothers, Southern Living, Strawberry Fair. Bookmark the permalink. You remind me that I bought a bottle full of buttons lately and haven’t even looked at them yet! Now where did I put them . . . Wonderful purchases! I am especially envious of the Johnson Bros. plates. 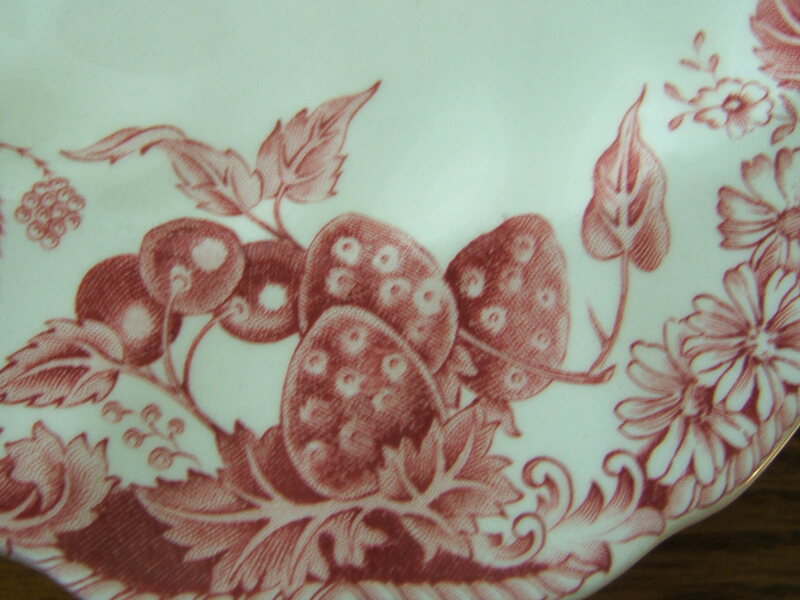 I love the Johnson Bros. plates, I saw some in an add for an estate sale a few weeks ago but when I got there they were already gone. I ALMOST stopped at Goodwill today but didn’t. I will do like you and go when I have somethings to donate. You make me smile! That little red plane is making me crazy between the two of us do you think we will ever find it? Love the Johnson Brothers plates. 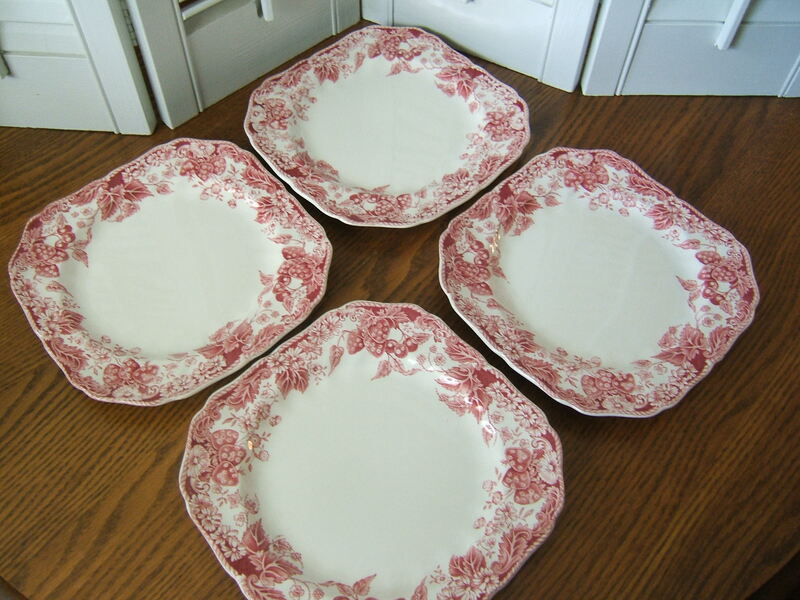 I adore those sweet dessert plates, love the color and pattern. 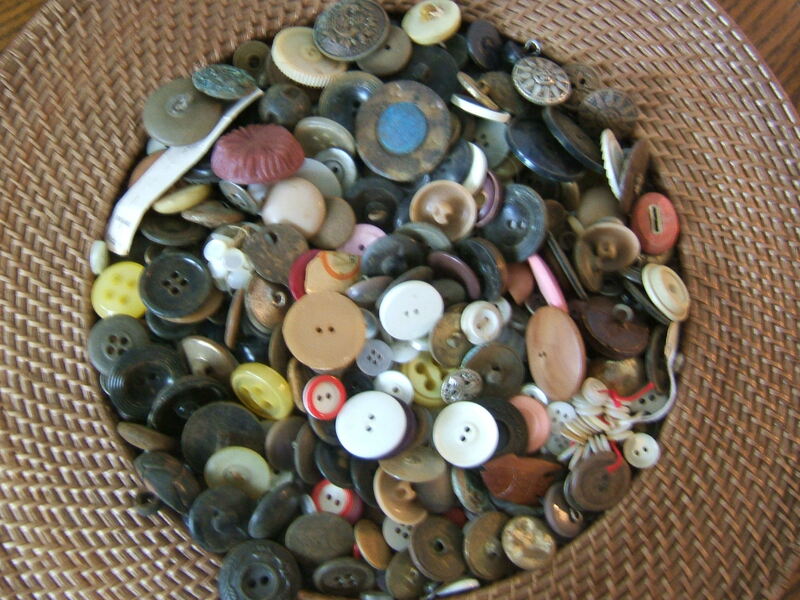 I have a hard time passing up a treasure trove of buttons. You’ll have such a fun time sorting through them. Hope you come up with some real gems.